Clark's Run originates in western Boyle County near Alum Springs and flows approximately twelve miles in a northeasterly direction into Herrington Lake, or the impounded portion of the Dix River. The area's early residents and businesses settled along the creek, and it served as a major water source for the settlers. 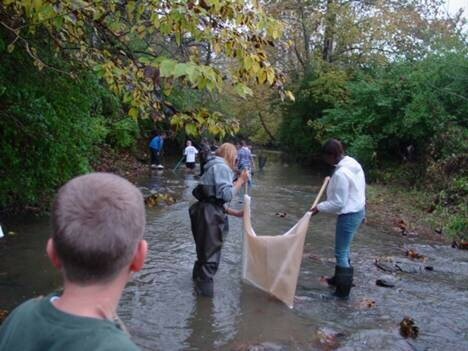 Today, the stream serves as a habitat corridor for plants and wildlife as it passes through the city of Danville. The stream is a major tributary of Herrington Lake, a drinking water supply source for residents in Boyle, Mercer, and Garrard Counties and a popular recreational lake. The Clark's Run stream is named after George Clark, a brother-in-law of William Whitley who had a station on the north bank of Clark's Run. Clark, according to historic sources, improved the land in 1776 and produced a corn crop in 177. The Town Branch tributary of Clark's Run was used as a water source for Clark and other early settles in the area. On the Danville section of the 1876 Beers Map of Mercer and Boyle County, the area along the creek east of South Second Street (current location of Batewood Park) was identified as "Mrs. Tomkin's Trotting Track." The 1876 map shows bridges across Clark's Run at Fourth and Second Street. More recently, mid-nineteenth century stone walls were noted along the creek corridor and some of its' tributaries, further highlighting the importance of Clark's Run as a central feature to the local community. In the 1990s the area along the creek between the railroad tracks and 4th Street was used as the local fairgrounds. As Danville grew development increased the human impacts to Clark's Run in various ways. Local landfills have been located adjacent to the creek at various times in the past 200 years and industrial wastes have been discharged directly into the creek. Stormwater runoff continues to be directed into Clark's Run, which can discharge large volumes of water and carry pollutants. Treated sewage also ends up in the creek, and over the years several of the natural meanders of the creek have been removed by projects aimed at straightening the channel. Despite these negative impacts, Clark's Run has fared relatively well for a natural stream in an urban setting. A buffer of trees and shrubs protects the streambanks from excessive erosion and absorbs pollutants from the surrounding watershed. Trees also provide shade which protects aquatic organisms. CREEC works with local partners to enhance these protective features, record and document aspects of the water quality, reduce negative impacts from the surrounding watershed, and provide opportunities for the community to enjoy and learn about this unique creek in our backyard. Please join us! Please print out our membership form, fill it out, and mail it to us to join our efforts to protect and enhance Clark's Run as a community resource for Boyle County.